Excel Spreadsheets on your Palm. Palm Integration for Excel (MobiSystems) comes with a Windows conduit that allows you to import and export Microsoft Excel XML and CSV documents to and from a Palm device, laptop or desktop computer. Automatic conversion of XLS files to XML or CSV so you don't have to manually save files in a temporary XML format. Ability to keep your data up to date by managing one master document either on the Palm device or on the desktop computer. Preservation of the original document formatting is upheld when a worksheet is synchronized to the Palm device or desktop computer. Ability to create workbooks with multiple worksheets. Text, numeric, date and time, and Boolean field management. Ability to organize arrays and perform database operation. Unlimited number of Undo and Redo operations. Cut, copy, paste, and clear a single cell, selection of cells, selection of columns or rows, and even whole spreadsheets. Global find of workbooks and local find/replace of cells or text contained in cells. Spreadsheet zoom from 25% up to 300%. Deal with Numbers Quickly and Accurately. Working out complicated and time-consuming calculations, such as insurance quotations and mortgage payments or just keeping track of the family budget has never been easier on your Palm device. 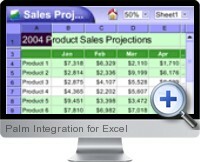 Palm Integration for Excel comes with a predefined library of over 250 formulas that assist in basic or complex data management and calculations of different information including: Mathematical; Financial and Statistical; Database, Look up and Reference; Date and Time; Logical and Informational. Data sorting in spreadsheets by several different criteria. Data formatting with support of number, text, currency, date, time and percentage format types. Support for multiple true type fonts that can be used in a single spreadsheet file (Palm OS 5 and later running devices only). Font styles and colors (Palm OS 5 and later running devices only). Background colors (Palm OS 5 and later running devices only). Support for black-and-white Palm devices. To keep the integrity of your spreadsheets, Palm Integration for Excel comes with a Windows conduit that allows you to import and export Microsoft Excel XML and CSV documents to and from a Palm device, laptop or desktop computer. This functionality is crucial if you want to be able to export workbooks created by Palm Integration for Excel right into Microsoft Excel. MobiSystems OfficeSuite Classic - Word and Excel for Your Palm or Handheld device. MobiSystems OfficeSuite Standard - Word, Excel, Agenda, and Painting tool for Your Palm or Handheld device. MobiSystems OfficeSuite Professional - Word, Excel, Database, Agenda, and Painting tool for Your Palm or Handheld device. MobiSystems Business - integrated with Office and designed to make the tracking of your finances and personal information easier while on the go.